When we met in Tampa, businesswoman Tina Hunter Greene came off as energetic and personable -- though her eye for detail was revealed when she noticed a dying plant in her office boardroom during our photo shoot. But another side of Greene was shown during tonight's debut episode of the 13th cycle of CBS's hit unscripted global competition, The Amazing Race. During an hourlong episode documenting her and once-estranged husband Ken Greene competing against 10 other two-person teams to travel from Los Angeles to a pit stop in Salvador, Brazil, Tina Greene was revealed as a hard-nosed competitor with a bit of a barbed tongue. Her husband Ken may have been a former pro football player and college football coach, but it was Tina Greene who was shown barking orders for much of the episode, pushing Ken to use any language skills he might have to communicate with the local cab drivers, and egging him into driving past competing teams in the initial race to drive to Los Angeles International Airport from the race's starting point in the city. But tonight's episode showed her mostly pushing Ken to move faster -- with hints during the preview for next week's episode that their alliance with another team may cause some friction with their fellow racers. "Sometimes I may come off like the Wicked Witch of the West, sometimes I may come off like Mother Teresa," Tina Greene told me last week, noting that she gave away some of her clothing to people she met during the race. I wrote a feature on Tina Greene for today's Floridian, documenting her idea of competing in the race as a way of determining once and for all whether she will stay married to Ken -- who admitted during the show that he cheated on Tina in the past, fracturing their marriage. Ken was expected to be in Tampa today for a private viewing party the couple arranged at the Westshore Yacht club tonight. In this week's episode, Ken and Tina are shown placing second in the scramble to reach the first pit stop, leading viewers to believe they might be around for some time to come. I really liked this team yesterday - - something about their interactions make me laugh. And I CANT believe they have a 27 year old kid...none of them look old enough to have a child that old lol..
You are their new best friend, Michael! "they didn't even say hi to me"
Tina and Ken Greene celebrate at a watch party for The Amazing Race. TAMPA - It's one episode down and how many more to go? Tina Hunter Greene can't say how far she and her estranged husband, Ken, make it on "The Amazing Race." But Sunday night the couple were holding hands and giving high-fives at a watching party where about 50 friends and co-workers gathered to cheer them on to victory. Tina, who runs BioPharmMed, a Tampa-based executive recruiting firm, and Ken, a former NFL defensive back who is now a San Diego-based building contractor, are among the 11 couples selected for the 13th season of the reality series. Sunday, viewers saw them make it through to the first leg of the 30,000-mile trek that will unfold over the next 13 weeks. There were cheers, squeals of excitement and laughter at the watching party whenever Tina Greene was on camera. On the first episode, Tina was intense and impatient while Ken was laid back. "It was the adventure of a lifetime and the hardest thing I have ever done," says Tina, the first contestant from Tampa to be on the Emmy-winning reality show. "It was just amazing," adds Ken Greene. The Greenes can't say how far they went or whether the journey saved their troubled marriage. They can't speak to the media again until their "Race" journey ends. In the opening episode, Tina, 49, and Ken, 52, arrived at the first destination near the head of the pack. An elderly hippie couple, Arthur and Anita Jones from Eugene, Ore., came in last and were the first to be eliminated. The Greenes entered the race for more than the $1 million prize. The couple were seeking to repair their marriage. They separated last year after more than six years of marriage. It was revealed on the program Sunday that Ken had cheated on her. Viewers saw him admit that he made a mistake and wanted to make it up to her. Ken is a former All-American college standout who played for the St. Louis Cardinals and the San Diego Chargers before leaving the NFL in 1984. He coached at Fresno State, Purdue and Washington State. "We are both in good shape and we like extreme outdoor adventure vacations," Tina says. On the first episode, their skills were put to the test as the teams dashed off from Los Angeles and ended up in Brazil, where they had to climb 240 feet down a cargo net that stretched from the side of a building to the street. The race was taped earlier this year and covers 23 days with stops in Bolivia, New Zealand, Cambodia, Kazakhstan, India and Russia before returning to America to wrap up in Portland, Ore.
Reporter Walt Belcher can be reached at (813) 259-7654 or wbelcher@tampatrib.com. I don't know why, but for some reason Tina cracks me up...oops, edit to say in a good way, I like her a lot lol. Actually, I like this team alot. I could fall in love with Ken, I can see why Tina married him. I hope things work out and they are together when all is over. Yes, look deep into my eyes. Don't get your hopes up Puddin - he kissed Terrance today! One of the funniest spots of leg 2! Good job Tina and Ken or is that Superman? now I am rooting for you 2 to win!!!! I hope you 2 work out your situation and enjoy each other forever. I LOVE ♥ Ken and Tina ♥ and think they can win!! Of course I love Ken and just adore Tina, they remind me of me and my bf in sooo many ways. 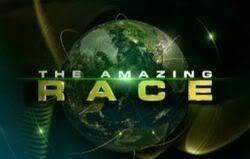 St. Petersburg, Florida -- A Bay area couple is still in running to win "The Amazing Race." Ken Greene and Tina Hunter Greene are one of three pairs vying for the million dollar prize on the Emmy-winning reality show. The Greenes watched the second-to-last episode of the show with their family and friends at Butler's Barbeque in St. Petersburg. Tina Hunter Greene, a Tampa businesswoman, teamed up with her estranged husband, a former NFL defensive player for the St. Louis Cardinals and San Diego Chargers. "We did want to win the money," said Hunter Greene. "But we really entered this and did this to try and save our marriage. Every night when we had a moment, every third night when we had a break, we really talked about that and tried to reevaluate." The Greenes couldn't tell us if they won and wouldn't tell us if the race brought them back together. "I think you'll have to watch the finale to find out," said Hunter Greene. "And I think it'll be clear then." actually rooting for these two! ST. PETERSBURG — Even as he stood next to his wife, Tina — holding her hand, complimenting her energy and providing lots of behind-the-scenes dish from their time competing on CBS' travel contest The Amazing Race — Ken Greene couldn't really answer the big question. Fans know that Ken and Tina Greene joined the sprawling international race to shore up their strained marriage; when the competition was filmed, he was living in San Diego and she was living in Tampa. But the pair is saving the big answer about their relationship for the show's finale Sunday. So even after a crowd of family and friends watched the couple confirmed as finalists competing for the show's $1-million prize at a St. Petersburg barbecue joint Sunday night, neither Greene felt comfortable talking much about whether the show saved their marriage. "Among all the other teams in the race, there were very few dealing with the issues we were tackling," said Ken, a former professional football player and college football coach. "It's been … the hardest thing I've ever done, including NFL training camp." Working together, the couple have scooted past eight other teams to land in the show's finale, standing out as the oldest pair left in contention (Ken is 52 and Tina is 49). They will face off against brother/sister team Nick and Starr Spangler and fraternity brothers Dan Honig and Andrew Lappitt. • Like many reality TV contestants, Tina Greene believes the show's producers have moved around her quotes and edited scenes to make her look more critical of her husband than she is, though Sunday's show contained some prickly moments from both. • Sometimes, the race action is affected by off-camera issues. In Sunday's episode, the teams gathered their first clue on a Russian submarine. But Tina noted that when she and Ken arrived at the boat, the tourist attraction wasn't open. By the time it was opened three hours later, all the other teams had caught up, eliminating their advantage. • The difference between winning and losing this race is often a good cab driver. In Sunday's episode, Tina and Ken lucked into a Russian cab driver who had a GPS to help find obscure landmarks. Tina didn't realize until last week that another team stole their cab driver while heading to another clue. • Even the other teams competing in the race didn't know Ken and Tina were starting with their marriage under strain; the couple didn't tell anyone, to keep their rivals from using the issue to their advantage. "To me, it was not a lot of fun … it was work," Ken told the crowd before the show started, noting that he got worried when the race started at the Los Angeles Coliseum, because he'd never won a game as a player or a coach there. "It takes over your life," Tina said, just after Ken joked that she had dreams about the competition weeks after the race ended. "It was the first time in our lives that we have been away from family and friends and work. No computers. No e-mail. No outside contact. It just … it takes over your being, and it's all about the race and your relationship with your partners." By the time it was opened three hours later, all the other teams had caught up, eliminating their advantage. What is going on with this crazy race!? TINA AND KEN FOR THE WIN!!! Know I love you Tina and Ken! Congrats on overall second place! God Bless You both! Page created in 0.09 seconds with 32 queries.